It's Year 9 making birthday layouts for the younger of my two goddaughters, Ellia. I chose to go really colorful to match her colorful personality. It was a lot of fun to dig through cardstock scraps to find colors to match the polka dot background paper. It's always so satisfying to discover scraps that are exactly what you need. It justifies the huge amount of scraps that I save! 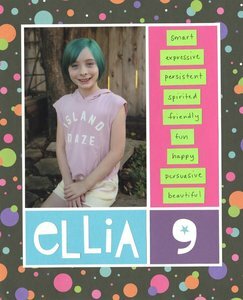 You can see the layouts from Ellia's previous birthdays here. She's grown and changed so much in 9 years, but she still has the same spunky personality! How fun is this! You should play with colours a lot more! Love love love this! LOVING how you pulled colors from the background piece!!! !